Admit it, you have been smiling all the time while watching this episode, kilig much? :) It sounds crazy but I love it, yay. 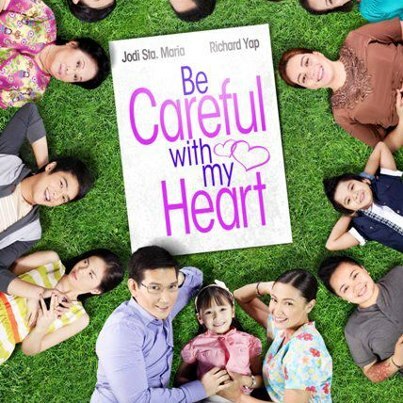 BCWMH is not your typical iyakan, dramahan, sapakan, apakan, sampalan teleseryse. It's a Kiligserye wherein everybody can relate. What I love most is that they share the Filipino culture, self determination, family values and the day-to-day basis of a typical Filipino household. I also noticed that the roles played by each character are genuine. They act so naturally that it will not appear as something "pinilit" compared to other artists. It seems that they are enjoying each other's company a lot. It's a good feel show with lots of kilig moments. I really admire the chemistry of Mr. Richard Yap and Ms. Jodi Sta. Maria. How I wish they aired this during Primetime so that we will sleep with GOOD VIBES. Kapit Bisig, Pilipinas! Here's the SIR CHIEF'S NATIONAL HARANA DAY episode, enjoy! oh yes ... smiling and giggling lol ... although sir chief's song was very simple, the soap had managed to build up the emotions and the expectations for this particular episode. recently, sc has been really trying to pursue maya ... in Be Careful With My Heart March 25 2013 episode, maya & sc are going to have a very intimate conversation ... so kilig!!! Hi im a big fan of be careful with my heart :) i really admire Maya coz she's a great actress. i love sir chief so much to the point that i really really wanted to see him in person. can you please give me updates regarding their mall shows? or their taping scheds and locations? i just want to see sir chief and take picture with him. it would be a dream come true for me :) i'll leave my email add cpagtalonia@yahoo.com thanks!